Explore the life and times of one of the greatest writers the world has ever seen in this wonderful, interactive introduction to his works. See where Shakespeare lived, how he worked and discover the plays he wrote, including A Midsummer Night's Dream, Hamlet, Macbeth, Romeo and Juliet and more. Includes over 100 stickers of artwork inspired by his work, as well as artefacts, advertisements and photographs of famous actors and scenes. 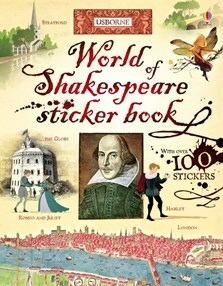 Includes a timeline, a complete list of works and even a section to practise Shakespearean insults! A brilliant way to learn about Shakepeare and a handy resource once completed. Includes Usborne Quicklinks to further online resources.